Successfully Added Button Camera - Video and Audio Recording to your Shopping Cart. 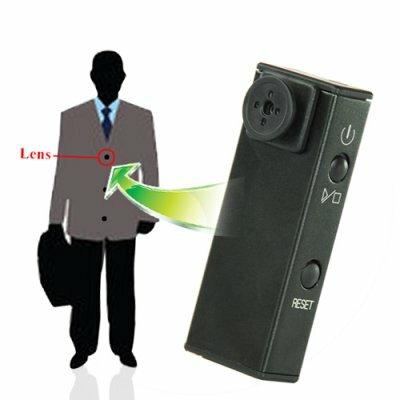 Mini style button camera DVR with high quality video and audio recording. This new HQ video model of our popular button camera line is so small that it can fit inside a chewing gum package, cigarette box, or DIY to any button up shirt for the ultimate in undetectable covert surveillance. While small in size, it makes up for it with technique. This model cam records directly to your TF card in 604x448-3GP video with 18 FPS and high quality mono AMR channel audio, giving you the best results you have ever seen from a hidden surveillance DVR of this size. The CVSD-629 is available right now at the usual Chinavasion wholesale discount price. Chinavasion makes it easy to order with direct shipping and Full QC testing before shipment. Available for single piece or stock orders. Compact DV recorder with 18FPS video capture. Now i can proof to my parents, that our teacher is TOTALLY NUTS. Everything that he will say i will record,and hi will never know a thing.